Are you planning to sit for the IAS exam? Do you think you are prepared? Even if you are not, if you are a little focused, you can crack the exam easily. IAS exams are held every year by the UPSC board. Out of every 10 Indians, 6 aspire to clear IAS exam. But how will you clear the exam? Before you sit for an exam, you need to know the eligibility criteria. Like any other exam, an IAS exam eligibility criterion is fixed. You need to be a graduate in order to sit for the exam. Without graduation, you can never become an IAS officer. This is done mainly in order to maintain the quality of the officers in the IAS. The next deciding factor is your age. You should be within the 21-32 years age bracket in order to sit for the IAS exam. This is only for the candidates from the general category. For other categories, the upper age limit is different. Before you decide to sit for the IAS exam, you need to know the syllabus. The tool in order to be successful and crack the IAS exam is the syllabus. You need to also collect previous year’s question papers in order to get an idea about the examination. Keep track of the UPSC calendar in order to get a clear idea about how to prepare yourself. You need to mark the important dates in order to plan your preparation properly. You have to understand that there are millions of students who are planning to sit for the IAS exam. Every year the pool of candidates increases, so you need to come up with a goal for yourself. For that, you need SWOT Analysis- Strength, Weakness, Opportunity, and Threat. To get the upper hand in the IAS exam, you can choose an optional subject on which you can put in more efforts. There is no fixed guide for choosing an optional subject. It differs from one student to another. How Many Rounds Are There In IAS Exam? It is very tough to qualify in IAS exam but not impossible. It can be broken down into three rounds – prelims, mains and the interview/ personality around. In each round, the students are eliminated only to choose the best ones. The preliminary exam consists of objective questions, and the student is scored on 400 marks. Only if you qualify in the prelims, you are allowed to sit for the Mains. What About The Mains Exam? The mains exam consists of around 9 papers. Each paper consists of questions which demand essay type of answers. If you can clear this round, only then will you be called for an interview. If you reach the interview round, do not lose your focus. Always remember that the numbers of candidates called are twice as some vacancies present. The interview consists of 275 marks. Based on your marks, you will be placed in different job positions. Beginners get more anxious before they sit for IAS exam. Do not panic as proper planning can help you to succeed. The first step for a beginner is to refer to their Social Science books from school. You have to read NCERT books from the 6th to 12th standard. Start making your own notes. Apart from books, handwritten notes are equally important for last minute revision. You have to ask yourself, whether you are socially aware or not? In order to know about the current affairs, you have to read the newspaper. It might not be easy at first but you need to develop this habit. Almost 40- 80 % of the questions in prelims and mains come from current affairs. Should you stop watching television? No, you shouldn’t. You need to select a good peer group in order to feel motivated at all times. Offline or online – what type of IAS coaching in Delhi do you need? It depends on a lot of factors. The first factor is the budget. Usually, offline IAS coaching is more costly than online coaching. You can save time as well as effort if you choose online IAS coaching. However, if you are a student and you are not working, offline IAS coaching is a better option for you. You can focus all your energy on your coaching. Many believe that you need to study everything in order to qualify for the ISS exam. But that is not the right thing to do. UPSC has come up with a well-bound syllabus for the IAS exam. Even though it is vast, it is not impossible to cover it up. How important is it to revise before your exam? Without revision, it is not possible for you to clear the IAS exam. Strategy differs from one person to another. It is not easy to come up with a proper strategy to help you’re your IAS exam preparation. 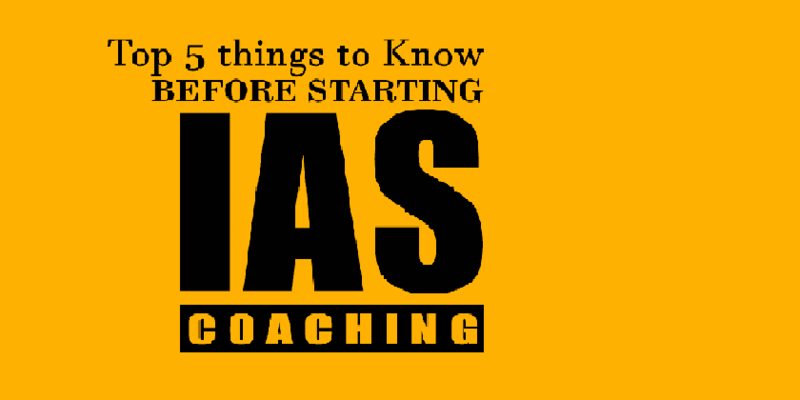 What might suit someone else may not be a good strategy for you to clear IAS exam. The first step towards making your own strategy is setting up realistic goals. A realistic goal will lead to an effective strategy. You have to come up with a study plan for yourself. If you work hard, then you can achieve the small, realistic goals that you set for yourself. So what are you waiting for? If you want to sit for IAS exam 2018-19, then you need to start working from now onwards. As soon as you start with your preparations, the more amount of time you will get for revision. The syllabus is vast, and you might require external help from outside. Do not panic and try to keep a calm outlook towards life. If you want to see yourself as an IAS officer, you need to focus and work hard.